Three lorry drivers have escaped injury after slabs of cement were thrown from a road bridge in County Down. 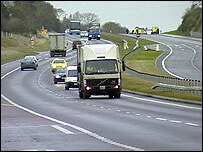 The objects were thrown from the Cascum Road bridge on the A1, just outside Banbridge, at about 1900 GMT. All three vehicles were damaged in the incident. Police have appealed for anyone who witnessed the incident to get in contact with them. Police said the lives of motorists had been put at risk by whoever threw the blocks. They said they would "deal robustly" with those responsible.